Most people have heard of the card game called Rummy. But what about three card rummy? Is this something you’re familiar with? If not you’ll be able to set that situation right as of now, because the Bovada Casino has three card rummy available as one of its games. Let’s find out some more about it. Bovada offers all its games on a practice mode or download basis, so you can try it out for free initially before deciding whether or not to wager real cash on the game. This is the best way to begin, especially if you don’t know the rules. In this game it’s just you and the dealer. There is no one else involved so this is a real head to head affair! This works in the opposite way to blackjack, where you have to get closer to twenty one than the dealer does. In three card rummy the target is twenty, and you have to get fewer points than the dealer as well. 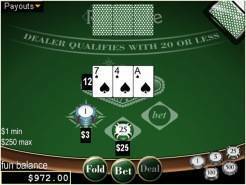 The dealer should never have more than twenty points otherwise you’ll win a prize on the ante that amounts to evens. How do they work out the card values? Most of them are straightforward. All the usual cards are worth the number on the front. The picture cards, i.e. the king, queen and jack, are worth ten points apiece. The ace is just one point. This is one of those games where you can read the rules and understand it to a degree. But it’s far better to start playing in practice mode so you can see how it actually works. There are suits at play here as well and not just numbers, so you can end up with a two card suited run out of your three cards. This isn’t worth any points at all, so you might have just one card worth a few single points out of a hand of three cards. As you play the practice game more and more you’ll get the hang of what you need to do to win. And with the dealer’s cards face down for starters, it can get very interesting indeed!